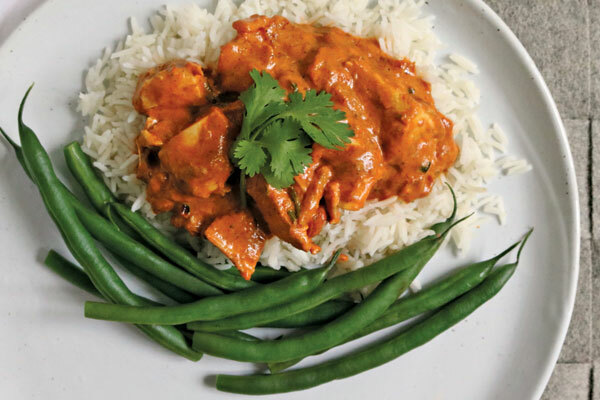 Who doesn’t love butter chicken? It comes together more quickly than you might think, making it perfect comfort food for a busy weeknight. If you really want to streamline things, start with a deli roasted chicken; chop up the meat (discarding the skin) to use in the curry, and save the drumsticks for lunch the next day. If you don’t have these spices on your shelf, swap in a curry blend or paste. Quickly steamed green beans or broccolini make an easy side, and the leftovers can be stretched to serve atop baked potatoes. Set a large, heavy skillet over medium-high heat. Add a drizzle of oil and sauté the onion for 3–4 minutes, until soft. Add the cilantro, if you’re using it, the garlic and ginger and cook for another minute. Add the diced chicken and if you’re starting with raw chicken, cook until opaque. Add the chili powder, cumin, garam masala, turmeric and salt to taste. Stir in the crushed tomatoes and cream and bring to a simmer. Cook, stirring, until slightly thickened and smooth. If it seems too thick, thin with a little water, tomato puree or cream. Serve over steamed rice, topped with cilantro. Serves 4. PER SERVING: 241 calories, 11.3 g fat (4.7 g saturated fat, 4.4 g monounsaturated fat, 2.1 g polyunsaturated fat), 106 mg cholesterol, 10.7 g carbohydrate, 23 g protein, 3 g fibre. Bake russet potatoes by scrubbing them, then rubbing with a mild vegetable oil, such as canola. Split and fill with warmed leftover butter chicken. If you like, top with grated mozzarella cheese and/or torn fresh cilantro. 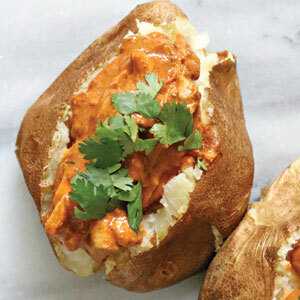 We love this idea that takes butter chicken on-the-go.